Wild Birds Unlimited introduced a "mini" hummingbird feeder a year or so ago, holding just 4 ounces of nectar but still sporting most of the outstanding features of a full sized WBU High Perch Hummingbird Feeder. It has the high perch that allows better and longer views of the hummingbirds, 2-piece non-drip design, super easy to clean, and clear bottom to view the hummingbird's lapping tongue. Fresher nectar for the birds. Because you are filling a mini with fresh nectar more often, hummingbirds are more attracted to it. Hummingbirds seek out the highest quality nectar they can find, and you are now providing refreshed, high quality nectar more often. Because the fresh nectar in a mini is consumed quickly, it is less likely the nectar will sit for days or weeks only to become moldy and bad for the birds. A great way to provide multiple feeders to deter bully hummingbirds. 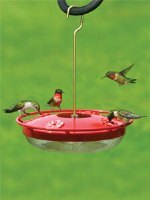 A mini hummingbird feeder is a cost effective and efficient way to hang 3, 4 or even more feeders around your yard to reduce the chances that a bully hummingbird will drive other hummingbirds off all the feeders. A great way to provide nectar late in the season. In late summer when hummingbird activity declines, a mini feeder is the ideal feeder to hang for late migrating birds. Put 3-4 ounces of nectar in the mini and replace it with fresh nectar every 4-5 days. You'll waste less nectar but still be providing a source of quality nectar for any hummingbird that comes through your yard late in the season. As you can tell, I've really grown to love this sweet little feeder and throughout the summer, I keep 3 of them around my yard. And now that we are in the days when the very last of the hummingbirds are passing through, I have a single mini in my yard and will keep it there well into October. One of these years, I may just be rewarded for my diligence! 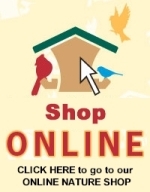 Get a Wild Birds Unlimited Mini High Perch Hummingbird feeder at Wild Birds Unlimited - Saratoga Springs NY, or at your local WBU or online. It's the beginning of September and the departure of some of our migratory birds is sadly well underway. I haven't seen male Rose-breasted Grosbeaks since the middle of August, and the females and young grosbeaks went missing around the end of August. Also departed are our Chipping Sparrows. I had boisterous little families of "chippies" visiting my yard until about late August as well. The last adult male Ruby-throated Hummingbird I saw was on August 13. Migrating females and first year birds, though infrequent, are still in the yard (at least as far of September 7). We're into the range of dates now when the last one will pass through, but I will keep a hummingbird feeder up and filled with fresh nectar until early October or so. This is when a our Mini Hummingbird Feeder really becomes valuable, so I'll only be filling with 3-4 oz. of nectar at a time. It's admittedly harder to track a "last seen" date than an arrival date, but try to jot down when you see your last of these birds for the season. It'll become a running count, where you change the date if another bird shows up. It's fun to track "last seen" dates and refer to them from year to year. I'd love to hear your "last seen" dates for any of the birds in your yard. Spring is one of the best times to watch bird behavior. There are a lot of special shows going on as birds establish territory and engage in courtship. When the female Rose-breasted Grosbeaks return shortly after the males, the males get about the business of attracting a mate. Here's one male's approach to impress a female at the birdbath. Spring migration is well underway! Sometimes we get so wrapped up with the arrivals of spring migration, we fail to notice or mark the departures. We were sad to see our Common Redpolls and American Tree Sparrows head back north to their breeding grounds. And we continue to see an isolated Pine Siskin every now and then as they continue their migration as well. The next few weeks promise to bring many more birds - some to stay an breed and others just passing through! I can't wait! !